"Fruits, like the pears used in this delectable tart recipe, are canned at the peak of ripeness, sealing in their nutrition, freshness and flavor, naturally." 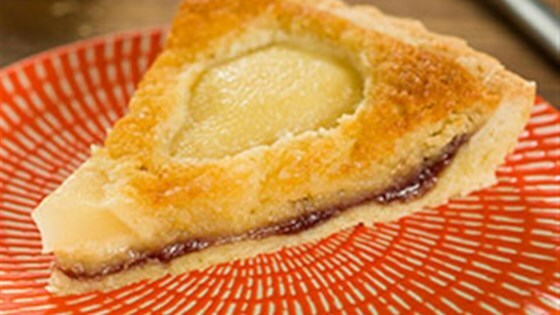 Prepare crust: With mixer at low speed, beat butter and sugar until light and fluffy; add egg until blended. Add flour; beat until blended. Grease 9-inch tart pan with removable bottom. Press dough into bottom and up sides of pan. Prick crust with fork. Spread bottom with jam. Refrigerate. Preheat oven to 350 degrees F. Prepare filling: With mixer at low speed, beat almond paste, sugar and egg. Add butter and almond extract; beat until just blended. Add flour and baking powder; beat well. Spoon mixture over jam in crust. Arrange pear halves, cut-side down on mixture in crust. Bake 50 minutes until filling is set. Cool completely. A very nice and elegant dessert. The raspberry jam complimented the other flavors very well. Pretty and a great dessert with wine. This is an easy to make, elegant dessert. The combination of raspberry, almond and pear is amazing.